You have probably heard of laparoscopic surgery. You know, the kind of surgery where the surgeon makes an itty-bitty incision and uses a camera to perform a procedure. In human medicine, many surgeries are routinely performed like this. You may not know, however, that more and more veterinary practices are performing this type of surgery. Oakland Veterinary Referral Services is happy to be able to offer laparoscopy and arthroscopy (within the joint) techniques for a wide variety of surgical procedures. What does that mean for your pet? Smaller incisions mean less pain, less trauma, and overall less invasive surgeries. There is evidence to show that a laparoscopic procedure can reduce pain after the procedure by up to 65%! Improved visibility for the surgeon means an overall safer surgery and a shorter time for your pet to be under anesthesia. Shorter procedures and smaller incisions mean a faster recovery for your pet, with many being able to be discharged from the hospital on the same day as the procedure! Studies show that pets are 70% more active in the first 3 days following surgery when a procedure is performed laparoscopically vs. traditionally. No plastic cone! Those big, awkward plastic cones that are so uncomfortable for your pet aren’t necessary after laparoscopic surgery. With all of these benefits, laparoscopic surgery is being recommended to make surgery easier for both pets and their owners. What types of surgeries can be done laparoscopically? Liver biopsies are the most common. Others include preventative gastropexy to prevent bloat, tube placement for nutritional support, and staging of disease. We can also explore joints in a minimally invasive, safe manner. This technique allows us to help you make the best decisions possible for your pet by gathering information in the least traumatizing way possible. Contact us today to find out more about laparascopy or the types of procedures that can be completed in this way. Your pet will thank you! This time of year, many of us are thinking of our New Year’s Resolutions. Maybe you are going to quit smoking, make a commitment to hit the gym more often, or spend more time with your kids. New Year’s Resolutions aren’t just for people, though. Your pet may have some life changes to make as well! Did you know that approximately 54% of the nation’s pet population is overweight, with the number getting larger every year? About 20% of these pets have owners who do not recognize that there is a problem. 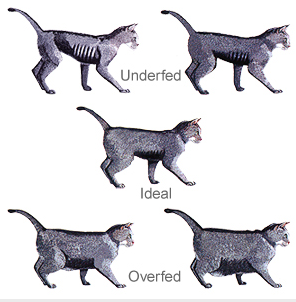 We see a lot of these pets here at Oakland Veterinary Referral Services because obese pets are at a higher risk for type 2 diabetes, high blood pressure, breathing problems, kidney disease, exacerbation of osteoarthritis, and a shortened life expectancy. Many pet owners are either not aware of these health risks, or they find their pudgy pets cute and don’t address the problem. A 95 pound Golden Retriever is equivalent to a 5’4” human female weighing 184 pounds or a 5’9” male weighing 214 pounds. A 10 pound Chihuahua is equivalent to a 5’4” human female weighing 242 pounds or a 5’9” male weighing 282 pounds. A Domestic Shorthair cat that weighs 15 pounds is equivalent to a 5’4” human female weighing 218 pounds or a 5’9” male weighing 254 pounds. A pig ear fed to a 40 pound dog is the equivalent of an adult human drinking 72 ounces of Coca-Cola. A regular dog biscuit fed to a 20 pound dog is similar to an adult eating 2 Keebler Elf Fudge Double Stuffed cookies. Check out your pet’s Pet-to-Human Weight Equivalent Translator and get tips on safe weight loss in dogs and cats, at this site. 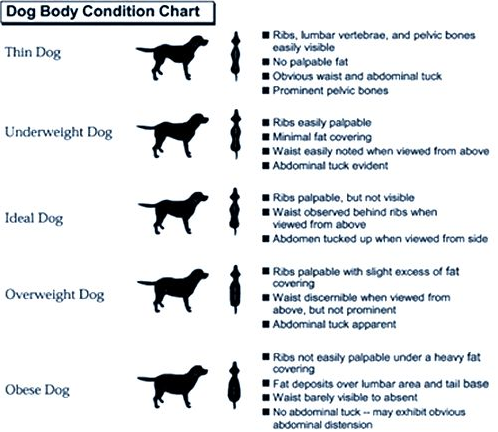 It is important that you discuss your pet’s need for weight loss and your plan for accomplishing it with your veterinarian to ensure a successful outcome for your pet. Please contact us today with any questions or concerns, and have a happy, healthy 2013!